Isabel ‘Ida’ Mitchell typifies the emergence of a new group of Irish women, particularly from Ulster, in the last quarter of the nineteenth century – the female Presbyterian missionary. Often the daughters of churchmen, they were usually middle-class and educated. Mitchell devoted eleven years of her life to Chinese women, even while back in Belfast on sick leave in 1910–12. When she first arrived, the Irish Presbyterian mission was a small operation, staffed by Sara MacWilliams and Reverend F.W.S. O’Neill. The mission district covered 5,000 square miles and a population of 500,000, including 1,300 Chinese Christians. By the time of Mitchell’s death, the region had a new hospital and dispensary, and six Chinese women had been trained as dispensary assistants. 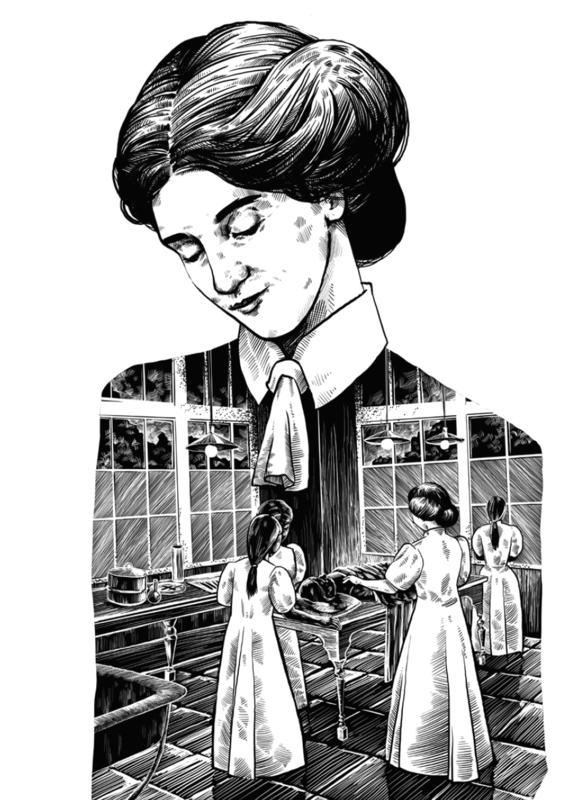 In 1893, Ida decided to study medicine, having heard that the China missions were badly in need of women doctors. Four years later, she entered Queen Margaret College, Glasgow University, where she was supported by donations from her father’s parish until her graduation in 1903. The Russo-Japanese War postponed her departure until October 1905. In the interim, she worked as House-Surgeon in a Manchester dispensary, taught Sunday School, helped in a Girls’ Club, and corresponded with missionaries in China. Mitchell was an outstanding student, winning four medals and two prizes while at Glasgow, but her application to her studies was the result of missionary zeal. Her intolerance of non-Christian religions is evident in her remarks on Buddhism: ‘It gives me a terrible hopeless feeling sometimes just to see it all, and to think what a tiny, tiny speck the Christians are in the midst of the millions who are so busy worshipping the idols.’ On arrival in Fakumen in November 1905, she immediately began learning Mandarin, with which she struggled greatly. Despite these close, comforting relationships, she described herself as medically quite alone and bore her responsibilities heavily. Her letters describe various cases, treatments and surgeries, such as the removal of malignant tumours from a 16-year-old who died the night following the surgery, and the amputation of the foot of a girl who had not walked for 8 months. Her greatest legacy was the opening, in October 1909, of a new women’s hospital supported by generous donations; it reopened several years after her death. After her return from sick leave in 1912, her next big project was to be the establishment of a fund to train Chinese women in western medicine – a dream that she did not live to realise. Her second legacy was the training of six Chinese dispensary assistants. Her letters to her mother convey her conviction that her work could improve lives. She vowed in 1915, ‘I want to fight tuberculosis. It killed two millions in China last year, and I want the girls to help me to fight it.’ She complained bitterly of the poverty surrounding her, and the cramped, windowless homes in which disease spread so easily. Her own health had been poor for a number of years, but deteriorated suddenly and she died in March 1917 of diphtheria, one of the infectious diseases that plagued the region. She was buried in the Russian cemetery in Jilin, where her sister lived. Her letters were published in 1917 by her former colleague, Reverend O’Neill, went through three editions in 18 months, and remain an invaluable record of women’s experiences of missionary work. Sources: F. W. S. O'Neill (ed. ), Dr Isabel Mitchell of Manchuria ( 3rd ed., James Clarke and Co., 1918); Myrtle Hill, ‘Saving the Empire? The Role of Irishwomen in Protestant Female Missions, 1870–1914’ in Religion and Greater Ireland, ed. Colin Barr and Hilary M. Carey (McGill-Queen’s University Press, 2015), 229–50; Rosemary Seton, Western Daughters in Eastern Lands: British Missionary Women in China (Praeger, 2013).